How was the fall of Jerusalem The “good news” of the kingdom? It was the Consummation of the Eschatological Wrath of God / It Was the Time of Redemption! What was “this the gospel” he was referring to? The antecedent discussion shows that it was the message of the impending end of the Old Covenant Age, and the fall of Jerusalem. Jesus was not referring to the Gospel comprehensively considered or defined. It was a very specifically defined bit of “good news” that he was referring to. That is not to say that the Gospel comprehensively defined was not included, because the proclamation of the Gospel of Christ, crucified, buried and resurrected, meant that the New Creation had broken in. That signaled the “beginning of the end” of the Old. Thus, my comments should not, in any sense be construed as saying that the Gospel comprehensively defined was not to be – and was not – preached into the world. My main focus is the immediate context of Matthew 24 that shows that the “good news,” the very specific good news that Jesus had in mind in Matthew 24:14 was the declaration and prediction of the end of the Old Covenant age. This is important for understanding Jesus’ comments in Matthew 24:14. In our last installment I suggested to you that the fall of Jerusalem, the destruction of the Temple, signified the end of the Old Covenant age, the Old Covenant ministration of Death. I shared with you how the NT writers and specifically Hebrews 9, speak of the time still future to them, but coming soon, when all hindrance to man’s entrance into the MHP would be realized and fully accessible. Per the Hebrews writer, the end of the Law of Moses and access and entrance into the MHP, heaven, are inextricably bound together. To explore that, we go to the book of Revelation. Notice that the Temple (the naos, ναος- The MHP) of God was seen to be opened. For John to be able to see into the MHP meant the Veil was gone! The implications of this are absolutely profound! One might be tempted, as some are, to jump to the conclusion that since the veil was gone, that man had full access to the MHP before the parousia, before the resurrection. But, that would be to cut short the narrative in Revelation. For brevity, let’s move to another text. “The temple was filled with smoke from the glory of God and from His power, and no one was able to enter the temple till the seven plagues of the seven angels were completed” (Revelation 15:8). So, here is more of the story of the MHP. John, once again is privileged to gaze into the MHP. But, notice that there is an “until” to the story. That “until” tells us that although the Veil was removed, actual entrance into that Sacred Place was not yet accessible, and it would not be truly accessible “until the seven plagues of the seven angels were completed.” God’s wrath had to be finished before man could enter the MHP. So, the filling up of God’s wrath and entrance into the Most Holy are temporally linked. What is significant is that even Dispensationalists agree that Luke 21:20-24 is about the fall of Jerusalem in AD 70. But, look closer at what that means. It means that the Jewish War was the time for the filling up– the pouring out of God’s wrath in fulness! And not only that, it would be at that time, the time of the coming of the Son of Man, when their redemption would be at hand. Now, it is sometimes argured that the Jesus was using the word “redemption” (Greek ἀπολύτρωσις, apolutrosis, Strong’s #629) not in a soteriological sense, but, to refer to their physical deliverance. This word can refer to physical deliverance, but, that cannot be its meaning here. Keep in mind that in Matthew 24:15f Jesus had given the disciples signs of his coming in the judgment of Jerusalem. He told them that when they saw the Abomination of Desolation foretold by Daniel the prophet (Daniel 9:26-27 / 12:9f) they were to flee. In other words, their physical deliverance, their physical redemption, from the horrors of the coming War would take place prior to the actual fall, prior to the destruction! Thus, their “redemption” in verse 28 is not a reference to their physical deliverance. It was the redemption mentioned in Ephesians 1:12-13 and 4:30– the redemption of the purchased possession. “Luke 21:20 must be A.D. 70 because it speaks of the days of vengeance, and this means “Those first century days are called ‘days of vengeance’ for Jerusalem is under the divine judgment of covenantal sanctions recorded in Leviticus 26 and Deuteronomy 28. Luke records that God’s vengeance upon His elect nation is ‘in order that all things which are written may be fulfilled.’ Jesus is telling the nation that God will fulfill all the curses of the Mosaic covenant because of Israel’s disobedience. He will not relent and merely bring to pass a partial fulfillment of His vengeance. Some of the passages that Jesus said would be fulfilled include the following: Lev. 26:27-33; Deut. 28:49f; 32:19-27; 1 Kings 9:1-9; Jeremiah 6:1-8; 26:1-9;Daniel 9:26; Hosea 8:1-10-10:15; Micah 3:12; Zechariah 11:6)” (Thomas Ice, (Kenneth L. Gentry and Thomas Ice, the Great Tribulation Past or Future?, (Grand Rapids, MI: Kregel Publications, 1999), 98). Now, Ice and other Dispensationalists, as well as representatives of other futurist views, sometimes object to the idea of AD 70 being the time of redemption because, they say, AD 70 was the time of judgment and vengeance, not the time of salvation. This attempted dichotomy between the time of salvation and the time of judgment is extremely unfortunate, and it is un-Biblical. See my book, Elijah Has Come: A Solution to Romans 11:25-27 for an extensive discussion of this issue. “Particularly significant for the meaning of higbir in Daniel 9:27 is the use of gibbor in Isaiah 9 and 10. Isaiah identified the Messiah, the Son of David, as “the mighty God” of the covenant formula by declaring His name to be ‘el gibbor (Isa. 9:5). Then in Isaiah 10 this messianic ’el gibbor is mentioned again in the very passage from which Daniel 9:27 derives its thought and wording alike (see verses 21-23). Isaiah spoke there of God’s mighty messianic fulfillment of covenant blessing and curse: a remnant of Jacob would return unto ’el gibbor, but in overflooding (sotep) judicial righteousness the annihilation (kalah) that was determined (neherasah) would befall the land. Daniel 9:26b, 27 echoes Isaiah’s prophecy: the covenant would be made to prevail (higbir), as a blessing for the many who were the faithful remnant, but as a curse in the form of the determined annihilation (kalah weneherasah) which would be poured out on the abominations of apostate Israel like a flood (setep). The unmistakable dependence of Daniel 9:27 on Isaiah 10:21 ff. points directly to the ’el gibbor of Isaiah 10:21 as the inspiration for the higbir of Daniel 9:27.This confirms the conclusions that the subject of higbir is not antichrist or any other than the anointed one whose name is ‘el gibbor and that the object of higbir, the covenant made to prevail, is the redemptive covenant sealed by the reconciling blood of Christ [i.e. the New Covenant].” (Meredith G Kline, “The Covenant of the Seventieth Week,” in The Law and the Prophets: Old Testament Studies in Honor of Oswald T. Allis (Nutley, NJ: Presbyterian and Reformed, 1974), 8-9). Now, when we realize that the time of the overwhelming flood of destruction of AD 70 was also the time for the bringing in of everlasting righteousness (Daniel 9:24) i.e. the New Creation, are absolutely tied together, we are better equipped to understand how the message of the coming destruction of Jerusalem and the Temple in AD 70 could have been – and was – called “this gospel (this good news) of the kingdom. And to return to Revelation, we can see there that exact conflation of concepts. So, we have in Isaiah, in Daniel, in Luke and in Revelation (in fact, throughout Scriptures), the conflation of salvation and judgment. 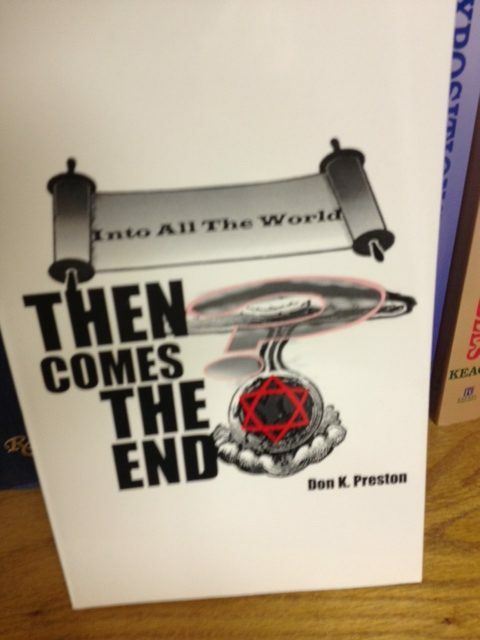 As we have seen, the time of Israel’s destruction would be when the New Creation would arrive. Is the New Creation wonderful news? Who would doubt that? But, was it “bad news” that the Old Covenant form of Israel had to be destroyed in order to bring in that New Creation? Of course! After all, Jesus said that time would be the greatest tribulation of all time. But, the fact that the destruction of Jerusalem was an awful, horrendous time, does not mean that we can divorce that time and those events from the birth of the New Creation, the everlasting kingdom of Christ! Thus, when Jesus foretold the impending dissolution of the Old Covenant age, with the attendant destruction of Jerusalem, there is no doubt that it was considered “bad news.” But, it was also wonderful, awesome news! It means – and means – that the never ending kingdom of God is now with man. It means that all men are now invited to participate in the salvation that flowed from Israel to the nations. The Old Covenant kingdom was transformed. The earthly house of this tabernacle was “dissolved” (from kataluthe, καταλυθe, Strong’s #2647). And now, The tabernacle of God is with man!” How is this not “the gospel of the Kingdom”? “Just as they have chosen their own ways, And their soul delights in their abominations, So will I choose their delusions, And bring their fears on them; Because, when I called, no one answered, When I spoke they did not hear; But they did evil before My eyes, And chose that in which I do not delight.” Hear the word of the Lord, You who tremble at His word: “Your brethren who hated you, Who cast you out for My name’s sake, said, ‘Let the Lord be glorified, That we may see your joy.’ But they shall be ashamed” (Isaiah 66:3-5). The Lord would slay the Old Covenant rebels, but save a remnant (Isaiah 65:8-13–> Romans 9-11). The Old Covenant form of the nation and people would no longer be “remembered” i.e. covenantally binding. The Lord would create a New People, with a New Name, in the New Creation (Isaiah 65:15-19). It is in this New Creation that God’s people now dwell in His presence, and enjoy eternal life. So, in light of all of the evidence we have adduced for properly understanding Jesus’ words in Matthew 24:14, I hope the reader can better understand how and why he could and did call the message of the impending destruction of Jerusalem and Temple, “This Gospel of the kingdom.” We will conclude this series with our next installment, so stay tuned! 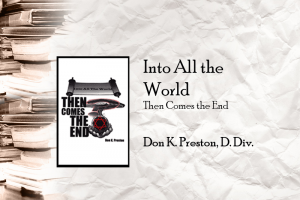 In the meantime, be sure to order my book, Into All the World, Then Comes the End, for a great study of the completion of the world mission in the first century.